Drama in Omsk, HC MVD’s Cinderella Story, Magnitka’s veterans and fantastic Army Derbies. KHL.ru remembers the series with the most astonishing turns of events. The reigning champion faced a Cinderella team who the year before didn’t even make it to the playoffs. It looked like an accessible path to the Cup for Kazan. There’s a reason if HC MVD went through three playoffs rounds, getting the best of Lokomotiv. And there’s a reason also if they enjoyed home-ice advantage: in the regular season, HC MVD accumulated more points than the reigning Gagarin Cup champions. Things didn’t look easy for Kazan when they had to renounce to Danis Zaripov and Alexei Morozov due to injuries, but Ak Bars managed to scoop up two wins in Balashikha as defensemen, and Dmitry Obukhov took the lead. But at this point, the unthinkable happened: Kazan lost three games in a row! All started at the Tatneft Arena, where the team’s forwards combined for only one goal. The situation didn’t change back in Balashikha, and Oleg Znarok’s militia went up 3:2 in the series. Just in the sixth game Kazan’s forwards clicked again and with their back against the wall tore HC MVD to shreds for a massive 7:1 win. Defensemen, checkers, and Niko Kapanen all scored as Zaripov and Morozov watched the game from the stands. The seventh game was the tensest in the series, and Kapanen and Nikita Alexeyev did all they could to protect Petri Vehanen’s effort, not to have him posting a shutout in vain. It was Ak Bars’ second Gagarin Cup. At the fourth KHL season, the Kazakhstani club was anxious about the playoffs first round. Barys always had excellent regular seasons, with many points and an entertaining game, but in the postseason, everything turned upside down. Astana couldn’t take even one match, let alone an entire series. To be fair, Barys mostly faced Ak Bars, which was almost invincible in that era. Thus, in 2012, when they were about to meet Metallurg, it almost looked like the light at the end of the tunnel. In the early 2010s, Magnitka had one of the oldest lineups in the League, with an average age second only to Dynamo Moscow. Magnitogorsk had thus an advantage – experience, and a vulnerability – lack of speed. In the first game, everything went according to the plans of Fyodor Kanareikin. The coach who already won the Russian Superleague title in Magnitogorsk bet on his veterans, and they didn’t disappoint. However, in the next three games, no Metallurg player could turn things around as Barys took the lead at the dawn of the great Bochenski– Boyd – Dawes line. The next three games were not for the faint-hearted. Being down 1:3, Metallurg was three times on the verge of suffering from an early-playoffs exit. Three games and three OTs. It was like walking on a rope, but Magnitogorsk kept its balance. Maxim Sushinsky, Sergei Mozyakin, and Daniil Markov killed any hope for Barys to get past the first-round barrier. In Omsk, the 2012 playoffs and the series against Dynamo Moscow are still remembered with mixed feelings. At his second coming, Raimo Summanen was finally welcomed among the greatest coaches of the team’s history. Not only the always-sincere behavior of the Finnish coach – at times resembling a volcano – but also the style of play of that Avangard is taken as an ideal. However, the Hawks never felt defeated like in 2012 spring. Up to a certain point, the team was working like a Swiss clock. After a strong run in the first three rounds, Avangard easily won the first game. And even the defeat in game two in Omsk didn’t cause much panic. Later in the series, the Hawks got back from Moscow being up 3:1. Their first-ever Gagarin Cup was almost in their pocket. Avangard Omsk had an incredible chance to became true heroes of the city. Alexander Popov didn’t move to Moscow yet, and his namesake Perezhogin was still a considerable part of the team. He scored two game-winning goals in Moscow and scored in all the first four games in the series. But when Avangard’s all-time top scorer stopped finding the net, the whole team stopped working like it was before. The Hawks wasted their first match point going down by three goals and scoring twice closer to the end of the regulation wasn’t enough to secure the win. They also lost game six, and game seven was the biggest disappointment in the team’s history. Avangard couldn’t find a solution to Alexander Yeryomenko, and eight minutes to the end their former forward Jakub Klepis gifted Dynamo the victory. After the final horn, coins and bottles flew from the stands, and the secret of Summanen’s torn jacket remains unsolved to this day. To get to their first and for now only Gagarin Cup finals, Traktor had to go through two incredibly hard series. In both the first round against Barys and the Conference finals against Ak Bars, Traktor started with a 0:2 score. The team led by the late Valery Belousov showed its true quality only when cornered. 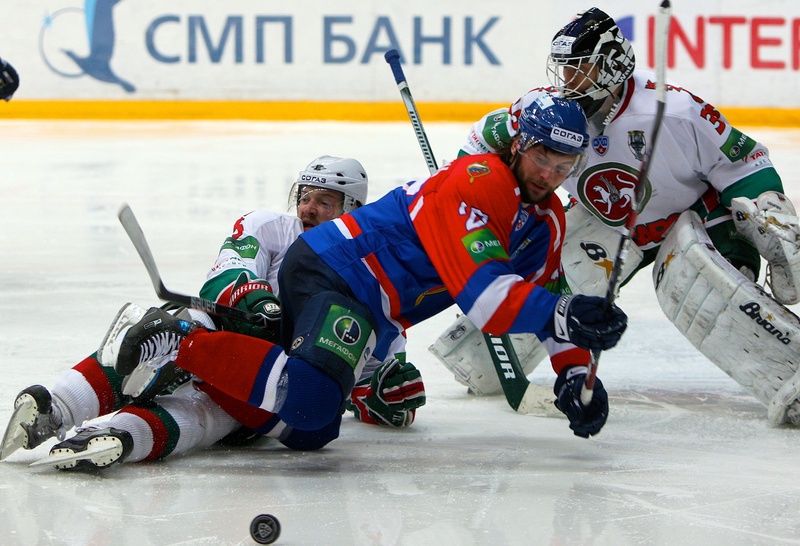 They had, however, an excellent chance to win already in the first game against Ak Bars. An early goal by Evgeny Kuznetsov at the second minute, but Ak Bars replied with two powerplay goals – with Konstantin Korneyev scoring in OT to secure Kazan a win. Kazan’s old guard of Evgeny Medvedev, Danis Zaripov, Alexei Morozov, and Jarkko Immonen played another great game the next day, and it looked like Valery Belov could have the same success as Zinetula Bilyaletdinov, then coaching Team Russia. Back in Chelyabinsk, the teams had completely different games, united only by having had the outcome decided in OT. Firstly, Anton Glinkin scored the first and only goal in the second OT period. However, the next day Danis Zaripov won the game for the Leopards with the regulation ended with a 5:5 score. Michael Garnett had a shutout the day before but couldn’t cope with Kazan’s potent attack. And who could imagine that game four was Ak Bars’ swan song for the season? Traktor won three games in a row, without allowing more than two goals. Chelyabinsk’s hero was Petri Kontiola. The Finn not only shot the winning puck in the fifth game’s OT but also contributed to the historic goal in game seven, when he found Andrei Kostitsyn during a counterattack with just 29 seconds to play in the third period. Time passes by, but the 2015 Army derby is still the best. Not only if considering the clashes between CSKA and SKA but in the whole Russian hockey. For the first time in history, a team managed to rally from a 0:3 score and win the series. Of course, the KHL didn’t always have best-of-seven series in the playoffs, but this doesn’t take away anything from this encounter. By the way, the subject was excellent, but the cast was remembering a Hollywood blockbuster. The legendary tandem Bykov and Zakharkin got back to the KHL to challenge Dmitry Kvartalnov – a rising star behind the bench. The line Panarin – Shipachyov – Dadonov could be seen in league’s play, and not only during the IIHF World Championship, and Radulov, Zaitsev, and Kovalchuk didn’t leave of the NHL yet. Alexander Radulov’s influence on the Red Army game was evident since the first game. CSKA won 3:0 and all the goals were set up by the restless #47. In the second game, CSKA’s first line decided the outcome of the game again, with the most valuable player being Roman Lyubimov, who had a career year that season. When the line gifted CSKA the third win in a row, the series looked almost finished. The Red Army was almost getting ready to meet Ak Bars, but the Shipachyov’s line started producing. Kvartalnov, who only applied cosmetic changes in his lineup before, started chaotically shuffling the lines, and this caused a heavy home defeat with a 2:6 score. Stanislav Galimov also didn’t look like himself and was first replaced twice, then lost the starting goalie position to Kevin Lalande. Bykov and Zakharkin never fell into panic and had the same behavior no matter the score. They managed to transmit great confidence in their players, who repaid them winning the series in game seven with a great shot by Patrick Thoresen.